March 16, 2017. 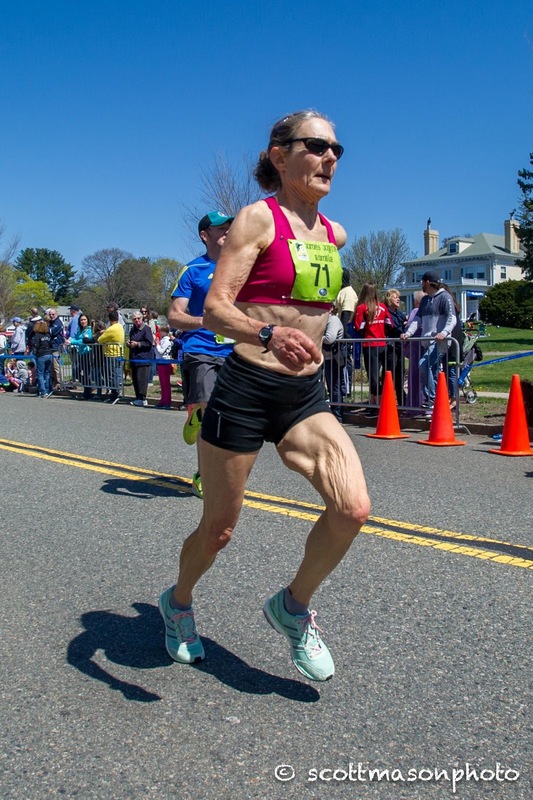 The first part of this report, posted on the 15th of March, focused on record attempts, age-grading, overall race, teams, and age groups up through 59. Now I focus on the 60 and up athletes. As noted, the course at Virginia Beach for the USATF Masters 8K Championships is flat and fast and has been the site for 3 different American Records that are still on the books. The weather is cooperating in some respects but not all. It is predicted to be overcast with temperatures in the upper 40’s at race time. All fine but there is a threat of rain and the accumulation forecast has moved up but is till below 0.1” per hour so not a big concern. The one concern is the winds which are forecast to be around 15 mph from the SW during the race. That means the runners will sometimes run into the wind and sometimes with the wind; we will hope that all of the gusts are concentrated in the tailwind section of the course from mile 2 to a bit past mile 4! W60. If past is prologue it appears that Impala’s Mo Bartley is the favorite in the group. At the USATF Masters 10K Championship in Dedham, she had a 2 minute gap on everyone who was there who is entered in this 8K and at Club XC in Tallahassee, it was well over a minute. After that it will be a tight contest between her teammate, Jill Miller-Robinett, and Atlanta’s Mary Richards and Cynthia Lucking. 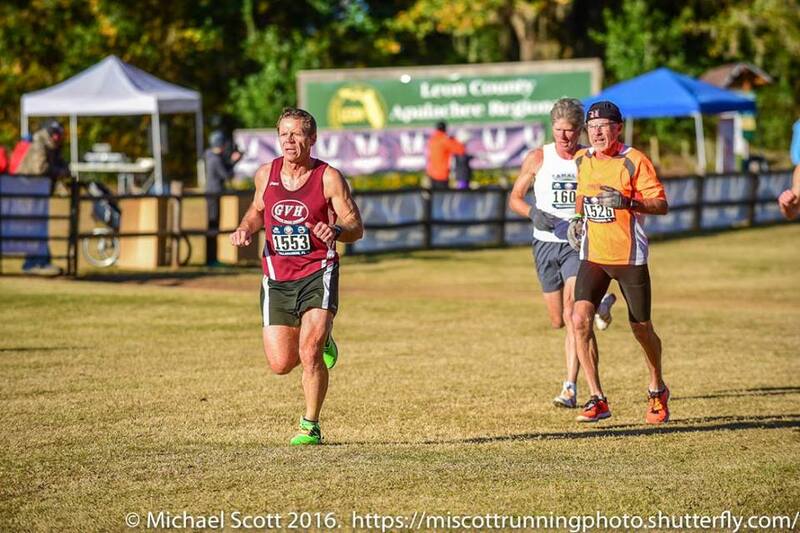 Miller-Robinett had the edge at their last meeting at Club XC in Talllahassee, besting Richards by 13 and Lucking by 24 seconds. Miller-Robinett also bested them both at the 10K championships in Dedham. Margaret Meek Taylor and Cynthia Williams will not be far off should anyone falter. M60. Brian Pilcher, whether he is in shape to get the record or not, should win the race. He has recently run 17:20 and change in a couple of track 5000’s. That suggests he can come in under 29 under good conditions and that should be enough for the win. Dan Spale, of the Boulder Road Runners, was only a minute back from Pilcher at Club XC so if Pilcher is a bit off his game, it is possible he could catch Pilcher. And Spale's teammate, Kyle Hubbart, is almost as fast. Spale ran 38:41 to Hubbart's 38:49 at the Bolder Boulder 10K so on a given day, he could be in the mix as well. GVH's Gary Radford and Shore AC's Reno Stirrat could also have something to say about who winds up on the podium. Radford could definitely figure in although there is even less recent evidence on his current fitness. Last year Hubbart ran Syracuse but not Spale, and Spale ran Club XC but not Syracuse. Radford finished 4 seconds back from Hubbart in the 5K at Syracuse and a half minute behind Spale at Club XC. 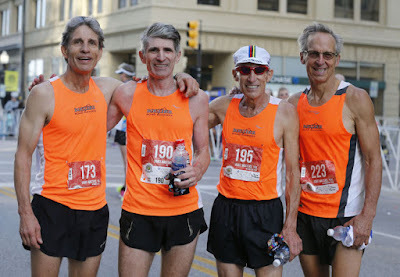 The Masters 10K Championship at the James Joyce Ramble is probably a faster race than the Bolder Boulder but Stirrat ran 38:28 there so if he is on his game, he can definitely run with that crew. The only doubt is whether he has regained full fitness after losing some time in the fall to a freak foot injury and then a heart issue that popped up and kept him from full-out training for a few weeks. The only recent evidence is a 4 miler in 25:23 in early February. That suggests he is off his best but it has been several weeks since then so we will see. W65. Edie Stevenson, from Boulder CO, is the defending Champion. She took the title at Brea in 35:49. She also showed a fair burst of speed in breaking 22:00 at the Syracuse 5K. As the course here is much faster than the Brea course, it is certainly possible she could break 35. It is unlikely anyone else in the race will finish in much under 40 minutes so Stevenson should win handily. The Impala's Donna Chan would have been in the hunt for a podium spot but is out injured. GVH's Cindy Ingalls did not run from May until late September last year and was off her normal standard at Club XC. 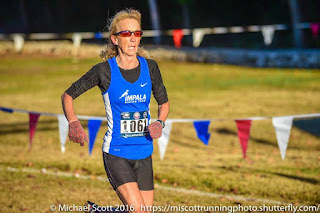 In 2015 she ran 51:44 at the USATF Masters Championships in Dedham, roughly equivalent to 41 minutes or a little below for an 8K, and showed good speed at the 5K in Syracuse where she clocked 22:43, roughly equivalent to a 29 minute 8K. If she has been able to regain that level of fitness, Ingalls will have a good shot at 2nd place. But she has not run any races since Club XC so I am guessing her fitness is still a bit off. Diane Kukich, of the Pike Creek Valley RC, will give her a fight. She has generally run her 5K's in the mid-23 to mid-24 minute range. The middle of that range suggests she could break 40 minutes which should be enough for 2nd if Ingalls is still a bit off her best.Another runner who could be close to 40 minutes is Virginia's Kathleen Doswell who ran 41:30 at Brea, a tough 8K course. M65. Ordinarily Tom Bernhard would be the heavy favorite in this group. But he had his knee scoped in mid-December and lost training time before and after the surgery. He ran a 19:03 rust-buster 5K a week ago. Most 65 year old's would be delighted to get that close to breaking 19 but when one is used to running below 17:30 as Bernhard is, it seems rather pedestrian. Still it is roughly equivalent to a 31 minute 8K so Bernhard is likely to be in the mix for the podium. Peter Mullin and Doug Bell become the favorites. At the USATF Masters 5K Championships in Syracuse they clocked 18:16 and 18:31 respectively. Mullin is back close to the top of his game after being off for most of 2015. Mullin ran 1:26:40 at the Houston Half Marathon in early January and ran 19:12 at a 5K in early February. Bell ran a recent 5 miler in 32:50 but he is always dangerous. It seems likely that Bernhard will be able to stay with them through most of the race and then they will sort it out over the last mile. Kirk Larson who ran 19:27 at Syracuse will be right there and is always a threat for a medal. W70. Dianne Anderson, of the Impala Racing team, and Suzanne Gibson, of the Colonial Road Runners are co-favorites. Anderson ran 27:13 at the 5K Championships in Syracuse, captured Age Group Gold Medals at both the Club XC Championships in Tallahassee in 34:53 and at the challenging USATF XC Championships at Bend this February in 43:33. Gibson ran a 27:40 5K last year and a 5 miler in 43:49 in December of 2015.Contenders for the other podium spots include Irene Terronez who ran 51:03 at the 8K Championship at Brea last year. Kathleen Jefferson, with a predicted time of 50:00, could also be a contender but I can find no race results. M70. This is a tough group to handicap and not only because I am in it but because fitness seems to vary a lot from year to year and even from month to month. Doug Goodhue who has dominated whatever age group he has found himself for the past decade, is still rehabbing a lower leg injury. Gary Patton who won the Masters Grand Prix last year for this group, is focusing on the track. At Club XC last year, Przemek Nowicki, was out with a quad problem, and I (Paul Carlin) was in comeback mode from a hamstring. If we go by the outcome of Club XC last December, the last time most of these runners met, we would make Jim May the favorite, followed by Gene French, followed by Jan Frisby, M70 Runner of the Year in 2015, followed by Paul Carlin. Richard Kutzner was bested by Nowicki and Carlin at the Syracuse 5K but came in ahead of Frisby. Kutzner ran a 1:40:47 half marathon in early January but then had to pull out of the XC Championship at Bend due to a hamstring strain. He said he was recovering nicely though, so probably he is fine. Carlin ran a 1:11:35 15K in early February but fell back to a 1:14:01 at Gasparilla in late February. The faster time is equivalent roughly to a 1:42 Half Marathon or a 37:00 8K. Based on that Kutzner would definitely be favored in a long race but I have shown more speed for short distances in the recent past. I beat Kutzner in the 5K at Syracuse and ran a 42:19 10K to win the Masters Championship in Dedham. But the latter was before a hamstring setback. May has no races I can find since Club XC so that may mean he is not at peak fitness but it is hard to know. Gene French ran a recent 8K in 36:03. Frisby's fitness was coming along nicely in January and early February but then he ran into problems with an old injury. Still his recent workouts have been pretty good. Nowicki says he has hamstring problems which reduce his effectiveness. He is running primarily to help his team.But Nowicki says Marc Bloom who joined their team recently, is the faster runner. That makes him a definite threat.His 5K's have been in the low 21's to low 22's and he ran a 4 miler last year in 28:18. May ran 20:55 at Syracuse last year. It looks like Carlin, Frisby, Kutzner and May all could win it; they are really co-favorites. Frisby says he is a dark horse at best. French and Bloom are certainly not far off the pace and could factor into the podium as well. May should be picked to win based on most recent evidence. He had the best time at Syracuse and at Club XC of those entered here. After that, I will put me next, but it is on potential rather than performance, followed by our 'dark horse', Frisby. W75. Joanne Markley from South Carolina and Virginia's Judy Stewart appear to be tightly matched. Markley ran 57:11 on this fast course last year and Stewart clocked a 57:31 last November ion Richmond's slightly downhill overall 8K course. Madeline Bost, who has won the Individual Grand Prix for Women 75-79 for the last three years, should take 3rd place. Her best recent times are 37:52 for a 5K and 1:21:48 for a 10K. Both are consistent with running an 8K in around 1:03. Markley is familiar with the course so I will give her a slight edge. M75. Once he finishes his rehab, Doug Goodhue will be competing in this division. Ron Mastin, who won the Grand Prix in this division last year is not running. In the meantime, the top competitors appear to be Clifton's Tony Fiory and Atlanta's David Turner. Fiory ran 26:14 to finish 2nd in the 5K Masters Championships in Syracuse last year, and ran a 43:32 5 miler. Turner did not run Syracuse but had a few 5K's in the 26 to 27 minute range. His 55:10 effort at the 10K is roughly equivalent to a 43:44 8K. I will give Fiory a slight edge on the basis of his 43:32 five mile run. Fiory's teammate, Matt Lalumia, could squeak in ahead of Turner. 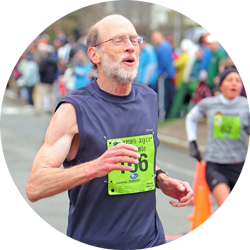 He had a slightly faster 10K time than Turner in taking 3rd place at the Masters 10K Championships in Dedham, 55:01 to 55:10. Furthermore his 5K time at Syracuse, 27:38, is equivalent to a 45:19 8K. Joseph Saley, also of the Clifton team, finished 19 seconds back from Lalumia at Syracuse and will stay close in the race and could factor. W80. Libby James is favored to break the record. There is no opponent who could appear and be favored against her. James will run against time and win the race as long as she finishes. James to win unopposed in record time. M80. Duane Lougee of the Tidewater Striders, will go up against the oldest registered competitor, Jim Askew, of Atlanta, at 81. Askew appears to have the edge. He has run a 57 minute 10K recently while Lougee's best is 1:01:08. Askew also has some 5K's in the 26 to 27 minute range. The latest forecast has softened a bit with respect to rain accumulation, back to .01 inches per hour and with respect to the wind 12 mph instead of 15. Of course the motto here, as elsewhere is, stay tuned. It could change again. Best of luck to all of the assembled runners of all ages in the 8K race on Saturday morning. !! !The 2017 Masters 8K Champions will be crowned.!!! "You think you can or you think you can't...and you're probably right!"